View More In Condenser Microphones. The Saramonic SmartMic is a professional condenser microphone specially designed for iPhones, iPads, and other iOS devices. The microphone has a 90 degree directional capsule that limits unwanted noise pickup from your surroundings and provides crystal clear audio pickup from the subject. 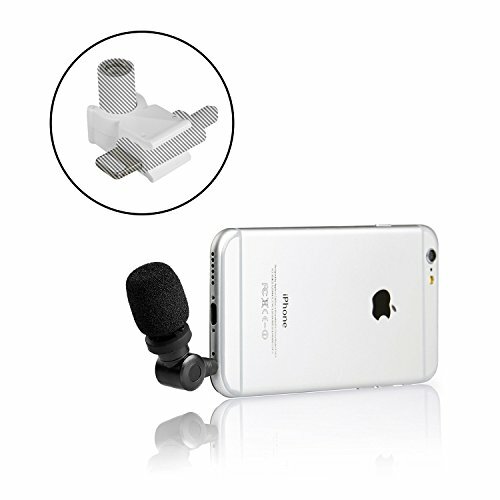 The iMic provides significantly improved audio recording quality when compared to your device's built in microphone. The new iPhone 7 design no longer includes a 3.5mm jack and instead uses a dongle adapter cable for any 3.5mm accessories. The IP-X500 is a lightning cable clip for the iPhone 7/7 Plus that secures the dongle to the iPhone creating a rigid and secure connection for your microphone and other 3.5mm accessories.